All Hallows is by far the most interesting of the three churches which Diocesan architect and renowned medieval historian Munro Cautley designed for Suffolk. If Cautley's ghost will forgive me, it is the only one which really matters. It is a building of national importance, outstanding of its kind, but incredibly it is only now going through the process of being listed by English Heritage. Here is a building of great liveliness, much more so than his more prominent and well-known St Augustine of Hippo nearby, built some 10 years earlier. 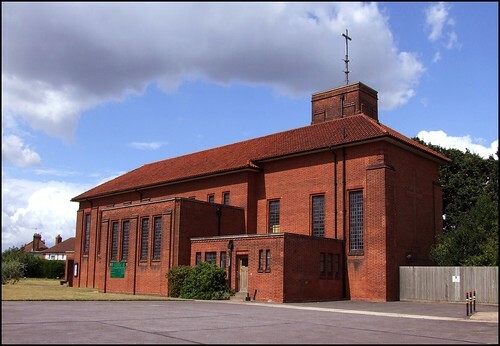 There, perhaps, Cautley was reacting against the unashamed Modernism of Felixstowe St Andrew, a late 1920s church in the Evangelical tradition by Hilda Mason and Raymond Erith. 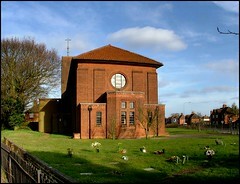 But at All Hallows he went a step further, and produced what was perhaps the last Art Deco church in England. It must already have seemed old-fashioned, to be building in the late 1930s a perfect example of the Jazz Modern enthusiasm of the 1920s. Across town, Cachemaille Day was building St Thomas in a cool, neo-Scandinavian style. The clouds of war were already gathering, and the architecture which would follow the peace of 1945 would be quite different, a deliberate rejection of what was seen as the ossifying conservativism of the likes of Art Deco. How unfashionably decorative All Hallows must have seemed then! 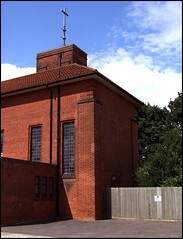 And yet, externally, it is not an ornate church, despite the little tower with its cross. 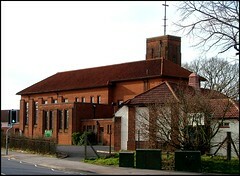 "People say it looks like a power station", Christine Garrod told me, when she was Vicar here. "I always say Good! Because that's exactly what it is!" Perhaps the most famous power station in all England is Bankside, now converted to become the fabulous Tate Modern gallery. All Hallows has the same gritty quasi-industrial quality, a soundness and symmetry about the way those red bricks build to their big-boned roof, with bold angles and geometric juxtapositions. It might be a small cathedral, almost. It is no coincidence that both Gilbert Scott and Cautley were medievalists at heart. 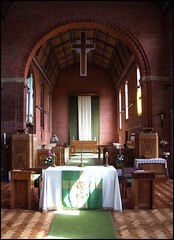 The parish of All Hallows is one of the poorest in East Anglia. It is one of just four places in Suffolk designated as a Social Priority Area by the European Community Social Fund. But almost the very first thing that Rick Tobin, the current Vicar, says to me when I meet him at the church is that "It's a lovely parish. Such a lovely parish." Here we are in the heart of the low-rise 1920s Gainsborough Estate. My house is barely half a mile from All Hallows, but the difference between where I live in the leafy avenues around Holywells Park and here is jaw-dropping. These are not streets that I would want to walk alone at night. But Rick Tobin does just that, and is known and loved by the people of the estate, young and old alike. He is a saintly, white-haired man, and somehow it does not surprise me when he tells me of walking through apparently confrontational groups of hooded teenagers, who break out into smiles and shout "Hello, Vicar!" On one occasion, the church suffered from a spate of stone-throwing, with many windows broken, especially along the secluded north side. After he had pleaded for it to stop, several burly, tattooed, shaven-headed older men approached Rick. "Don't worry Vicar, we'll find out who's doing it and deal with it", they told him. The stone-throwing stopped shortly afterwards, and has never recurred. 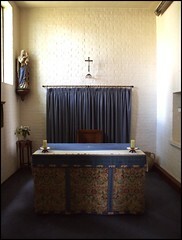 The great pearl beyond price which the parish of All Hallows has retained, but which so many urban parishes have lost, is that there are still generations of the same family living on the estate who have used All Hallows for their baptisms, marriages and funerals. It has become a touchstone for them and their families, and they feel a sense of ownership of the building. Gainsborough ward has one of the lowest levels of higher education qualifications of anywhere in England, but there is no doubt that in such a low income, generally poorly educated and predominantly white area, the local parish Church is still valued and treated with respect by ordinary people in a way that is fast vanishing elsewhere, despite the fact that many of those people may rarely enter it. This is a happy circumstance for a church building of any kind, which needs to feel the life of the community around it. It is also, of course, a deep irony. 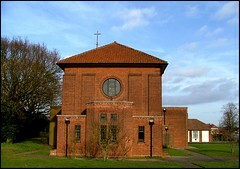 I think that All Hallows is one of the most significant 1930s buildings in Suffolk. There are a few which are more important, most notably, perhaps, the Royal Hospital School at Holbrook, and perhaps the Gaumont (now Regent) Theatre in Ipswich. But All Hallows is all of a piece, and its contents still largely in their original integrity, making this the finest complete document of the Art Deco movement in Suffolk. The cruciform building has an interesting shape, which suggests surprises inside. This impression is rewarded as you step through the doors. This is no mere hall. 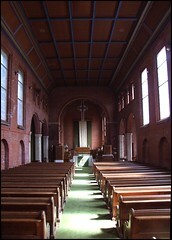 Instead, there is a lovely interior with a devotional atmosphere. 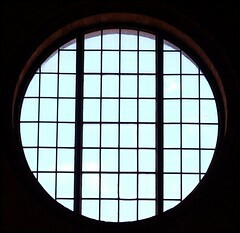 The dimness inside is pierced by high windows, amplifying the sense of the numinous. Cautley intended the people to use the double entrance either side of the west end, which opens onto a large space where the two streets divide. This is now a garden of remembrance. 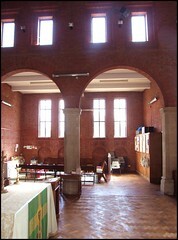 You can also enter by way of a sheltered porch on the north side of the building, into the north transept, which was at one time designated the 'Boys Brigade' chapel, but has been reordered to provide a space for young children to be together during the services. The fact that this places them closer to the nave altar than the rest of the congregation tells you something about the sacramental priorities of this worshipping community. 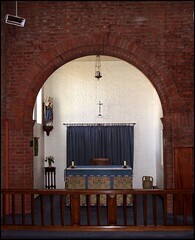 There are two altars. 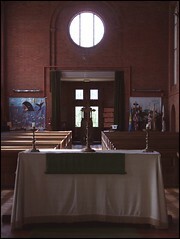 The nave altar is set in the crossing, and is the only modern intrusion into the space. It has been designed to fit in perfectly, although when the space is empty you sense Cautley's intention to create a pivotal area of Cathedral-like intensity. Behind are the marvellous matching Art Deco pulpit and lectern, like bakelite radios waiting for their dials to be fitted. Everything is inlaid walnut veneer, original features completely in keeping with the building. Beyond these are Cautley's choir stalls, still in use for their original purpose. 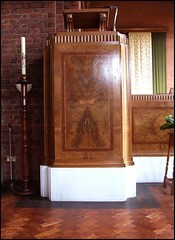 The high altar is a shrine, beautiful in its simplicity. 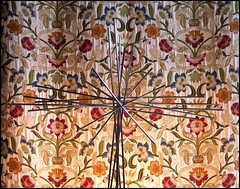 A narrow hanging offsets an exploding steel cross set on the altar itself. There is no frontal, just more of the walnut veneer familiar from the crossing. The south transept opposite the entrance is perhaps the most beautiful part of the church. 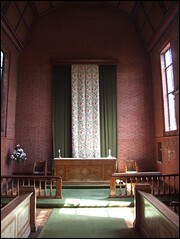 It is the Lady Chapel, curtained off from the crossing, and the only part not entirely Cautley's work; it was refurnished in 1951. Here, in functional brick with narrow lancet windows, so that there is the impression of being in an underground crypt, there is a beautiful devotional atmosphere. The sanctuary echoes the medieval integrity of the churches Cautley knew so well, with a piscina and aumbry picked out in brick. 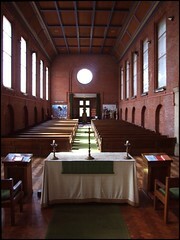 To the west of the church, the nave is the only one in Suffolk with a cinema rake, the back pews about a metre higher than those at the front, the sight-lines focused on the high altar. I remember Christine Garrod telling me that "The slope is very gentle, but we do have to warn funeral directors". Beyond the rake, a baptistery is filled with light; it was reordered in the late 1990s, and restored to use. 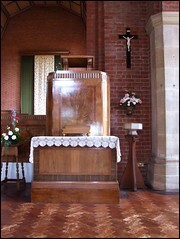 The font and cover are Cautley's design. The most overwhelming feeling you get from being inside All Hallows is a sense of sheer devotion. Here is something bigger than the world outside, an uplifting from the mundanity of material existence. I think it is no coincidence that each of the main Anglican parish churches on Ipswich's large deprived estates - Chantry, Gainsborough, Whitehouse and Whitton - is High Church in character. Rick Tobin asked me if I would like to go up the tower. Now, I have a great fear of heights. I have been told that this is irrational, but I am not so smug as to think that the laws of gravity do not apply to me. I'm also sure that, when my head starts to swim as I look down, this is my body's way of telling me to stay away from the edge. However, as with people who are afraid of spiders (how ridiculous!) I am always willing to try a little aversion therapy. Richard unlocked a narrow doorway, and I expected to see a flight of steps, but all that there was inside was electrical equipment. I waited for him to flick a few switches and then show me the way to the stairway, but instead he ushered me into the cupboard. There, against the wall, with a clearance from the organ works of about 18 inches, was a shaft leading upwards into darkness, a black iron ladder fixed flush to the wall. My heart started to flutter with panic, but having come thus far I began the climb up into the gloom. I could feel the shaft pressing against me as I clung on for dear life. I climbed higher and higher. Suddenly, I became aware that the space was opening out behind me. I am not sure which was worse, the confined space within the shaft, or the feeling that at any moment I would be falling backwards into the darkness. After about twenty five feet or so, I suppose, I came to the top of the ladder. I had reached the level of the internal church roof, and slightly behind me above my head was a narrow trapdoor. I now saw with horror that I would need to let go of the ladder, reach up to open the trapdoor, and then lean back into empty space to climb through the gap. Beyond the trapdoor, the ladder would continue within the dark void of the tower space. At this point, my sense of self-preservation kicked in, like an angry dog who wakes to find a particularly smug cat tucking into his food bowl. What had I been thinking of? Shaking, breathless with anxiety, I carried my sense of vertigo back down to dear, sweet mother Earth. I won't be doing that again in a hurry, but no doubt I shall dream of it regularly for nights to come. Rick Tobin was very understanding. So, how did Cautley come to design an Art Deco building? Well, he didn't really. He's using the language of Art Deco, but he's still thinking Medieval. Witness the clerestory above the transepts, the blind arcades in the nave walls, the brick arches on creamy columns reminiscent of Polstead. There is the baptistery, the transepts themselves, the Lady chapel. The Victorian Gothic benches that come from Ely Cathedral, and the medieval bell from a disused Norfolk church. Whichever way you look at it, this is a delightful, inspirational building, one which deserves many more visitors than it gets. 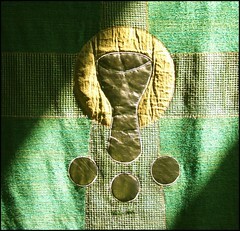 It is also the heart of a vibrant, living faith community; a power station indeed.